Labour protests have become the order of the day in Tehran and other cities across the country with workers and pensioners demanding payment of their wages; however, employers have come to regard these delays as a matter of course and often express surprise at the workers demands. 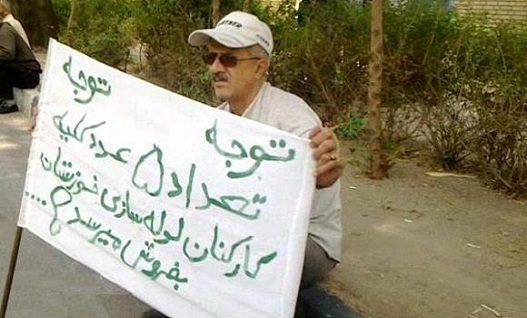 A worker holds a sign advertising that he and coworkers will sell their kidneys for cash in Iran. Photo from archive. Some employers, like Haft Tapeh Sugar Factory management, maintain that a few months delay is acceptable because the workers in their company are much better off than most other companies where workers have not been paid for over a year. Head of Sirjan Employment Office, Hamed Hadian, reacted to a banner carried by protesting workers of Sirjan Copper Company which indicated non-payment of their wages is leading workers to offer their kidney for sale. He stated that such statements over “a few months” of delay were unreasonable and inflammatory. “Where in the world have you heard of workers selling their kidneys over a few months delay in receiving their wages,” Hadian was quoted as saying. However, worker representatives say most workers could hardly manage their expenses while receiving their pay. With months of delay in payment of their wages, they have been seriously considering sale of their kidneys. Filing complaints against the employer after over three months of delay in payment of their wages in Sirjan, where the head of the Employment Office does not consider a few months delay in payments a serious matter, is clearly futile, so workers have been staging protests in order to be heard. According to state statistics, last year 1600 labour protests were staged in Tehran alone. Meanwhile 120 percent increase has been reported in the number of labour protests in the past four months in Central Province. Last Monday two protests were staged in front of Iranian Parliament. Pensioners from the Steel Industry and Education Ministry protested non-payment of their pension. Meanwhile textile workers in Ghaemshahr and Bahrgostar Hormoz Shipping Company workers were in protest since the night before in front of company buildings while City Transit workers of Ahwaz were in their fifth week of protests. Ghaemshahr Textile Company, one of the country’s oldest in the industry, has been in crisis for years and the number of its employees have been reduced from 1200 to 200. The Company has now been turned over to the municipality but workers wages have not been paid for over three months. On Monday workers stopped work and went on strike demanding to be paid. The 327 workers of Ahwaz City Transit have been on strike for five weeks. Following the protests they received two months of their wages but still must receive eight months of non paid wages. While protests over non payment of wages persist across the country, the Central bank has announced 11.4 increase in expenses of Iranian household. Meanwhile President Rouhani has congratulated his government over controlling inflation and giving citizens greater purchasing power. However, statistics indicate that household incomes are predominantly spent on housing and food with the latter getting a shrinking share. Only an average of two percent of household incomes is reportedly being spent on leisure and educational activities.